Foodgasm Alert! Foodies will savor every bite of this storyline feast! This story set in Milwaukee Wisconsin is a charming story of how baking a Coconut Cake can change the trajectory of your life and have the power to bring two people together or tear them apart. You will love the characters of Lou, Al, Sue, Harley, John, Gertrude, and Otto with each character adding their own special ingredient to the mix. My favorite scene in the book was when Lou and Al ate peanuts at the baseball game and ma Foodgasm Alert! Foodies will savor every bite of this storyline feast! 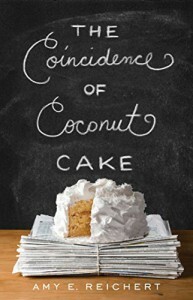 This story set in Milwaukee Wisconsin is a charming story of how baking a Coconut Cake can change the trajectory of your life and have the power to bring two people together or tear them apart. My favorite scene in the book was when Lou and Al ate peanuts at the baseball game and made a sacrifice to the baseball gods to appease them for a team win (dropping the shells to the ground). The only thing that I found unbelievable was that Al and Lou never really talked about their jobs or that Al didn't ask if Lou was her real name. Maybe I'm too curious when I'm on dates or getting to know someone but those are the questions I would ask. All in all it was a culinary delight that I recommend!